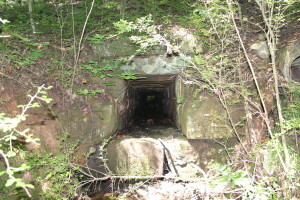 General information about the historic BMRR culverts. 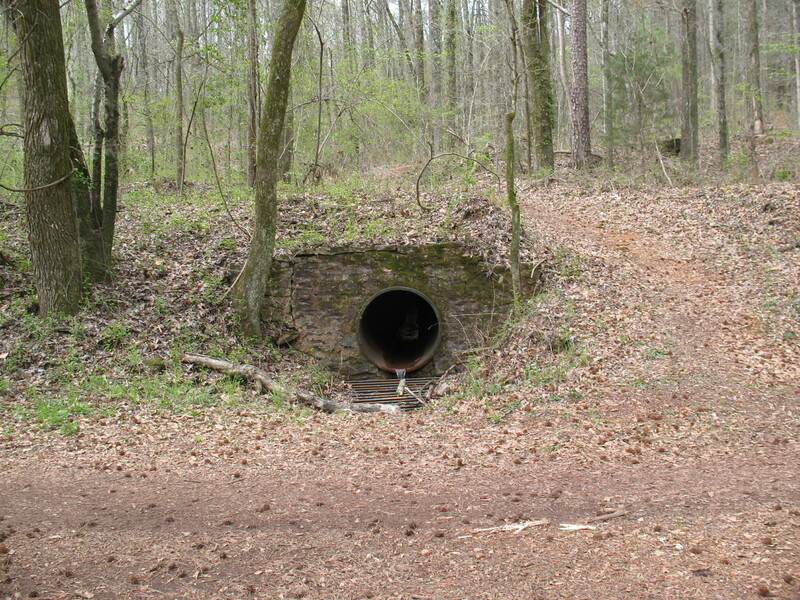 NOTE: Photographs and location information for the culverts follows this descriptive information. 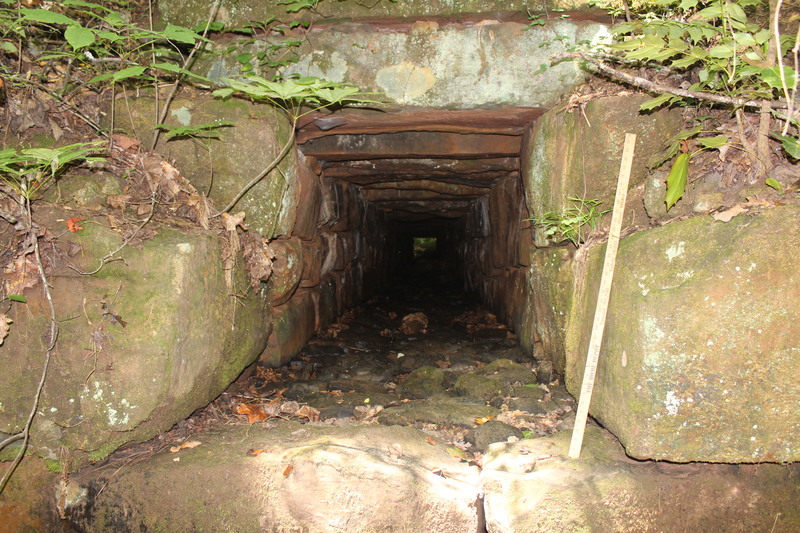 Purpose of the culverts: When the BMRR roadbed was originally constructed beginning in 1884 and as it crossed low places containing small streams or wet-weather flows, cut-stone culverts (usually rectangular) were built into the railroad roadbed. 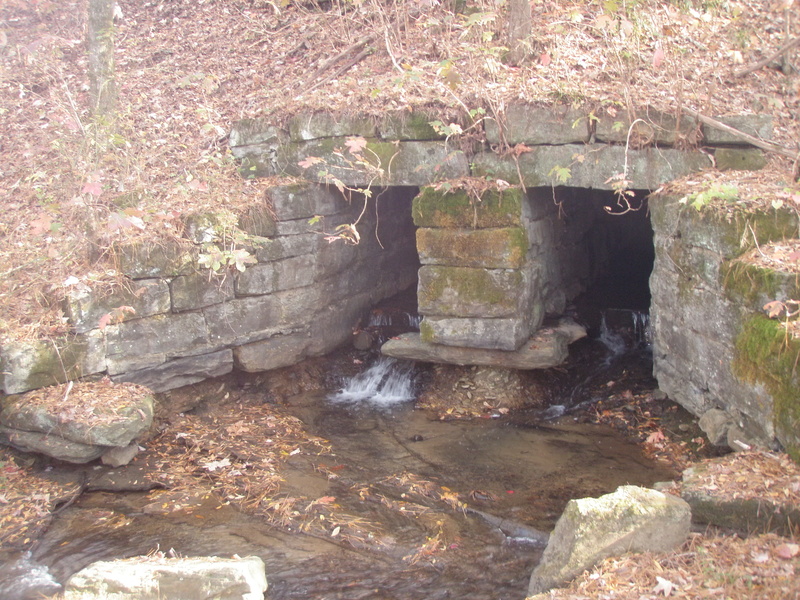 Many of those historic stone culverts (most of them over 130 years old) still exist, and all of them that have been found thus far still have spring-fed or wet-weather water flowing through them. 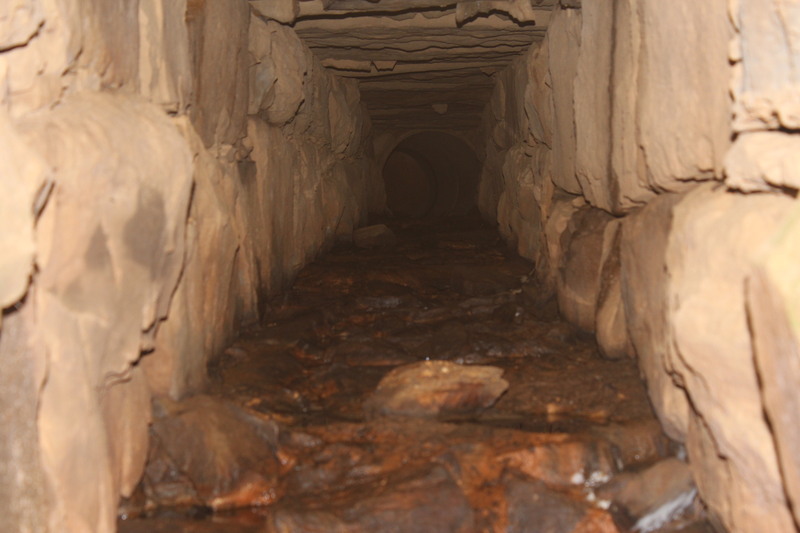 Likewise, in locations with less water flow, iron or terracotta (clay) pipes were used for the same purpose, and many of those still exist and are still carrying water through them. Usually hard sandstone, seemingly “hand cut” or “hand finished.” Sometimes quarried from nearby, but often transported from quarries that were not nearby. Huge blocks stacked without mortar or concrete. Most of the culverts are “single” meaning that they have only one opening passing through. 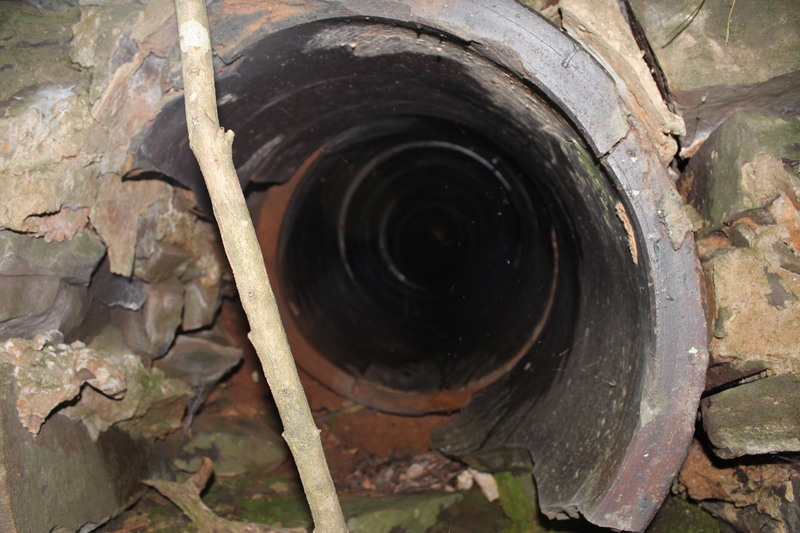 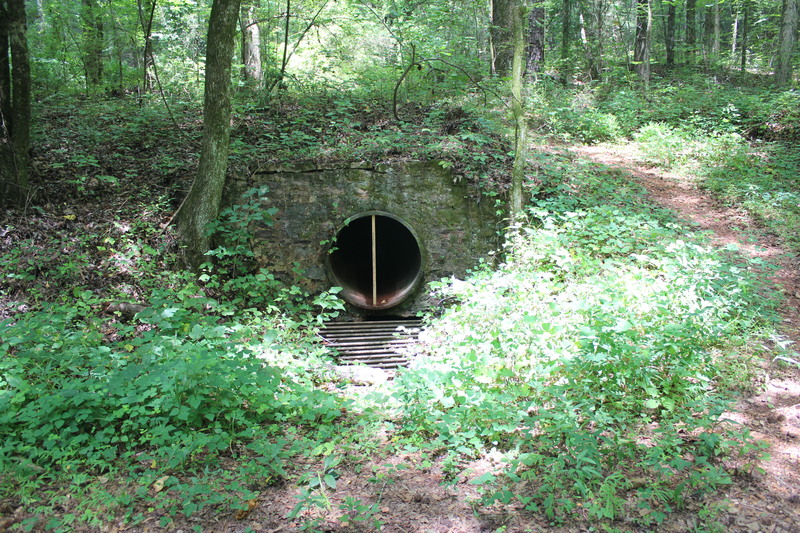 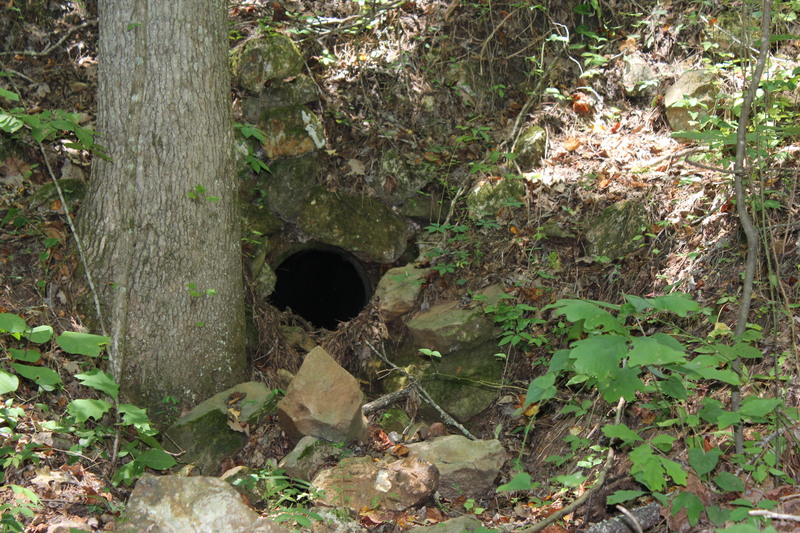 A few examples of “double” culverts have been found and are shown below. 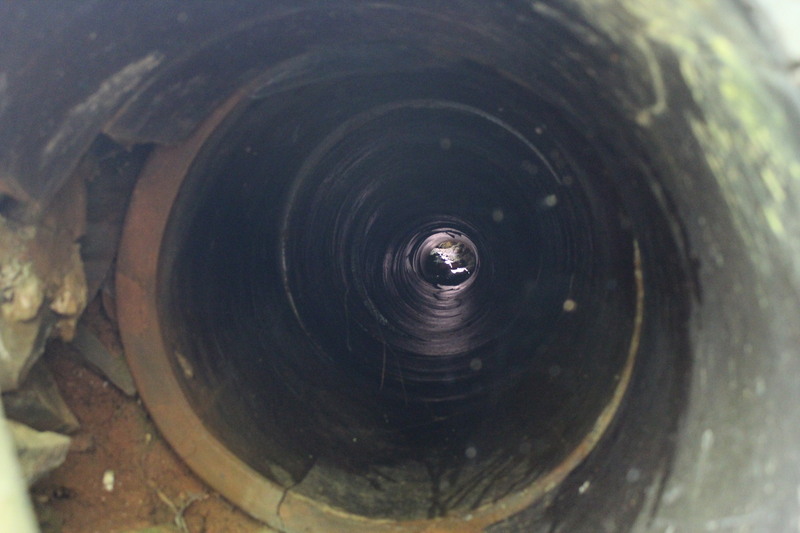 None of the culverts found thus far have any obstructions (such as twigs, tree branches, or trash) inside the culvert — all of them still are completely clear even though they continue to carry water through them. 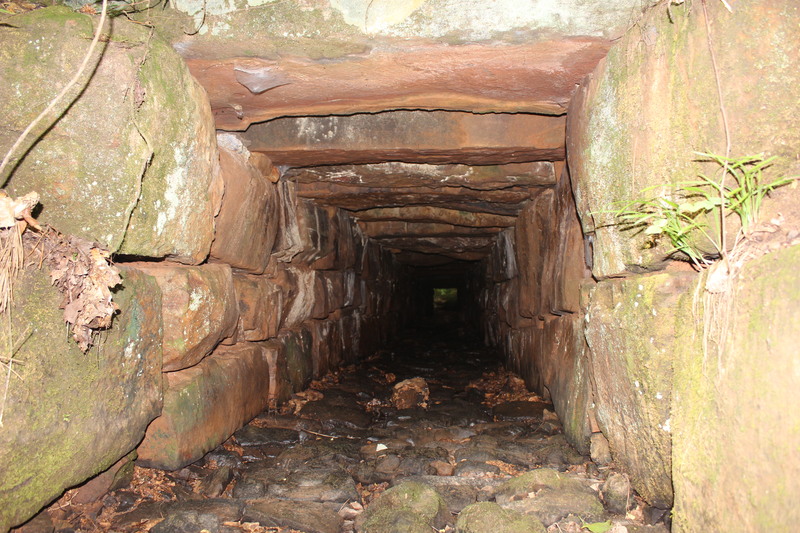 It is speculated that this may be due to the type of construction which has been observed in all of these rectangular cut-stone box culverts: (a) the underside of the lintels (the massive stones across the top) were made smooth the length of the culvert, (b) the sides of each of the stones stacked making the sides of the culvert are beveled outward (convex), seemingly chipped by hand, and (c) the exposed portions of the stones that make the bottom of the culvert have been carved (or chipped) into “knobbly” shapes or humps sticking up into the open passageway of the culvert. 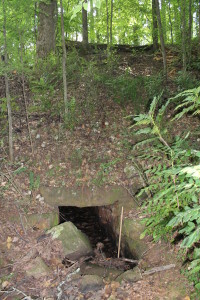 (If individual stones were placed side-by-side to make the bottom of the culvert, those always were placed vertically and were angled in such a way to make a humped surface instead of a flat, smooth one.) 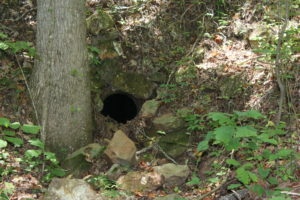 It is speculated that these three different types of surfaces were created on purpose to keep unwanted twigs, branches, leaves, or trash from catching inside the culverts and stopping them up. 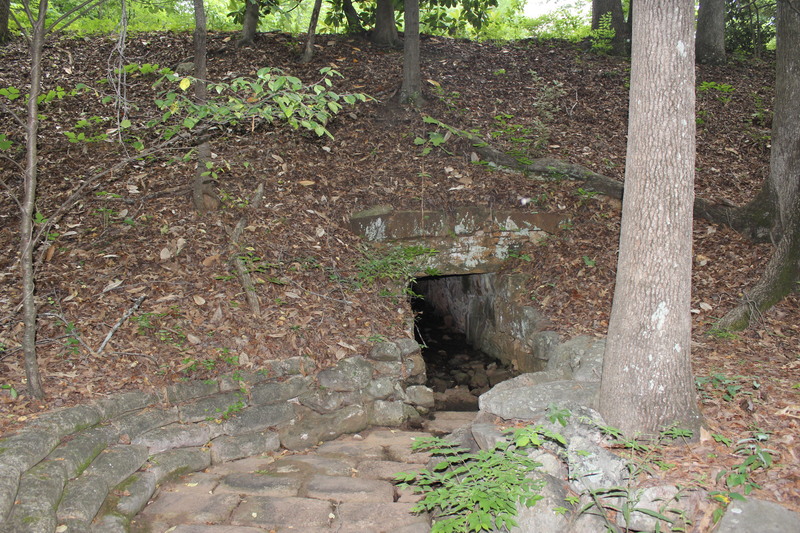 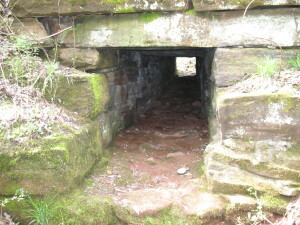 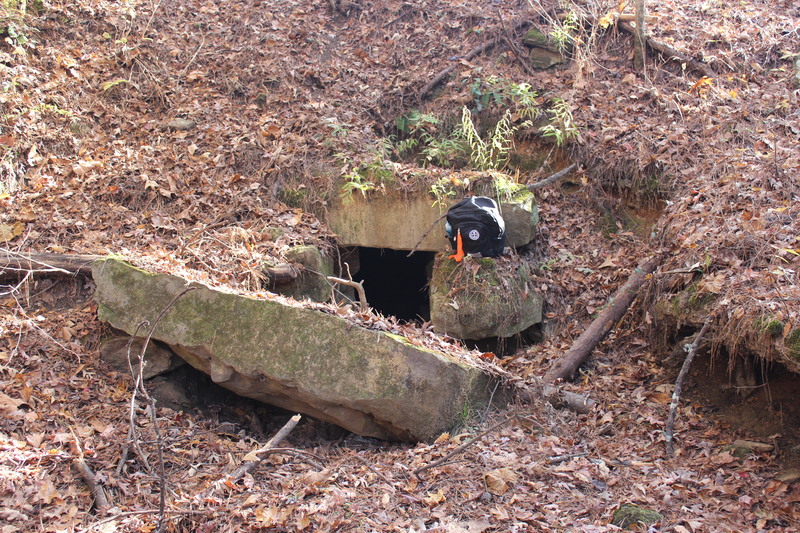 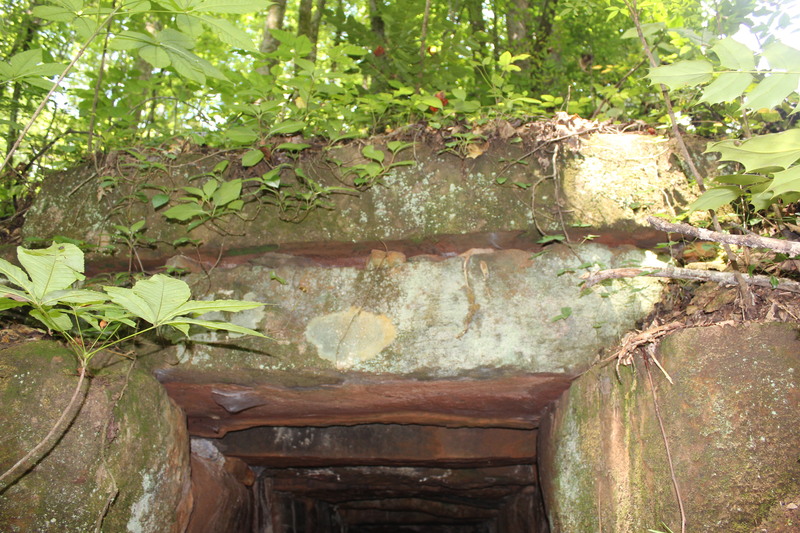 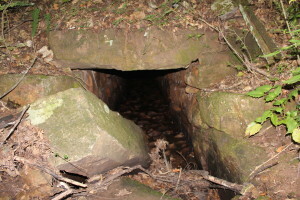 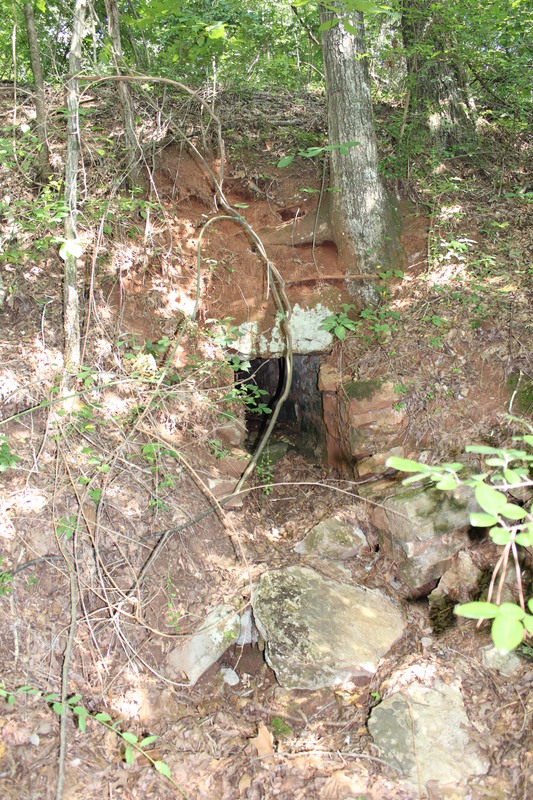 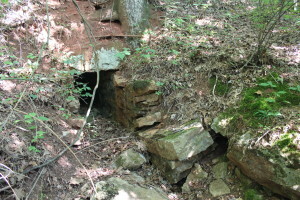 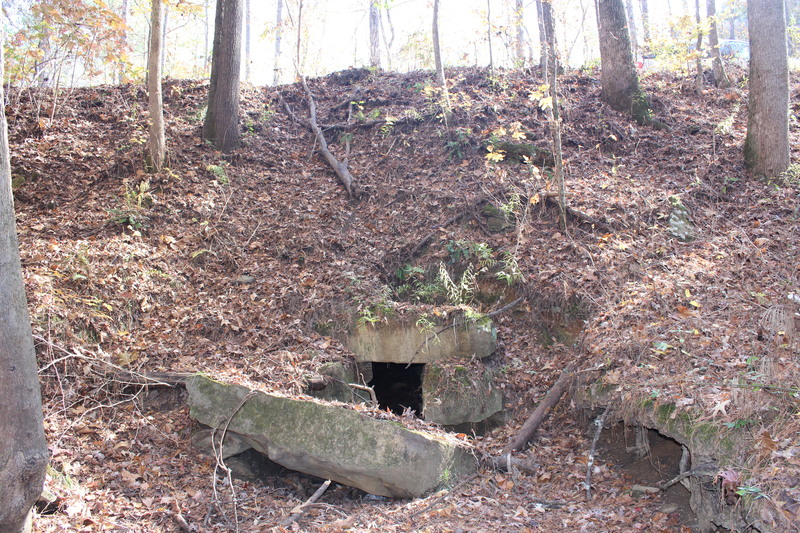 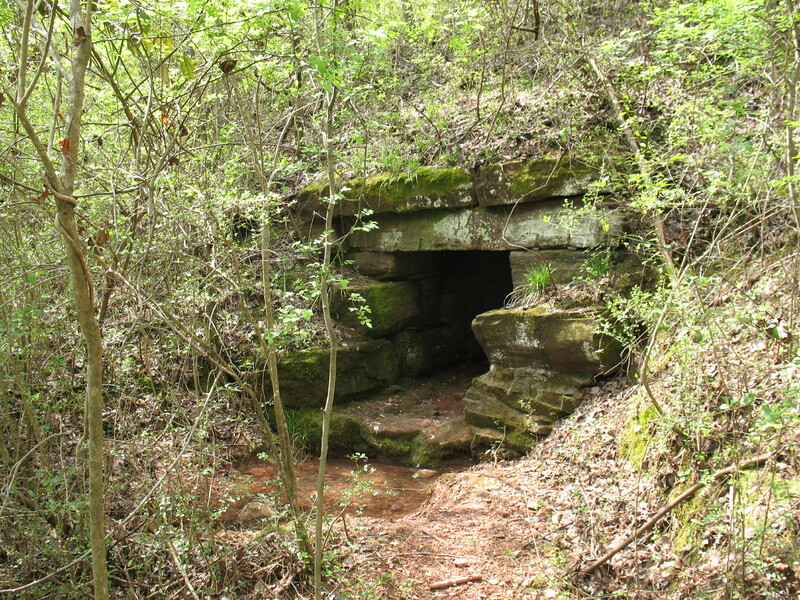 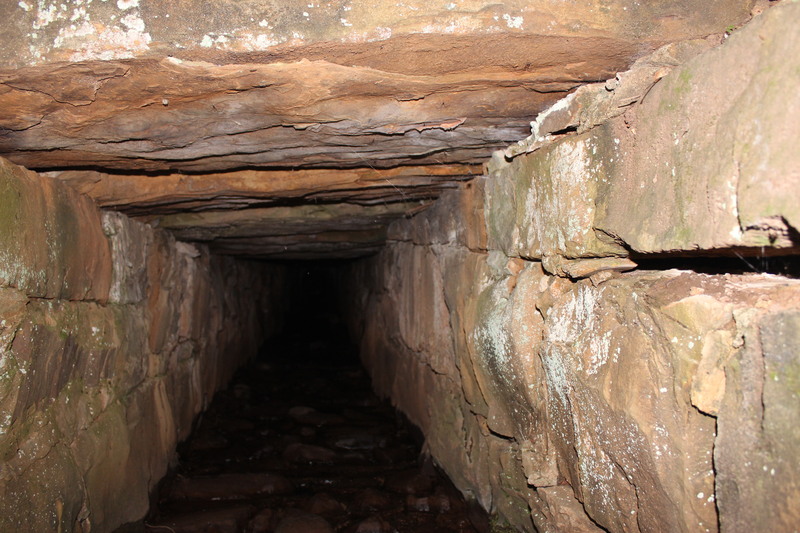 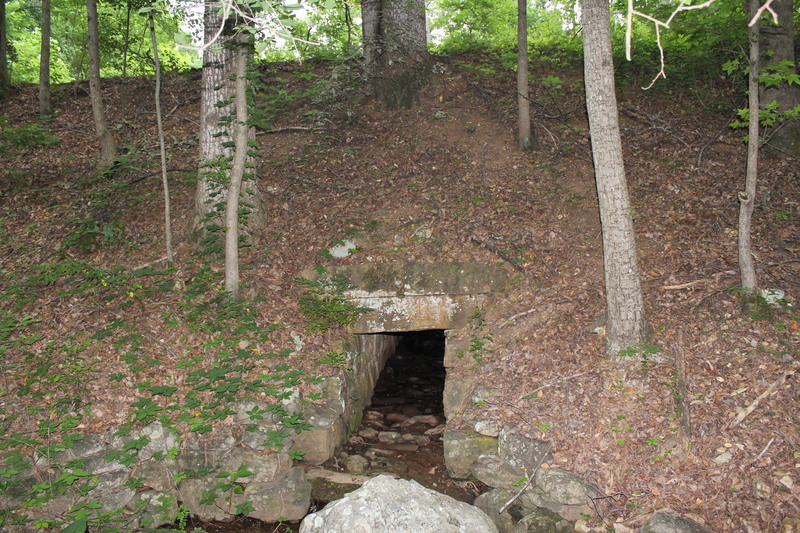 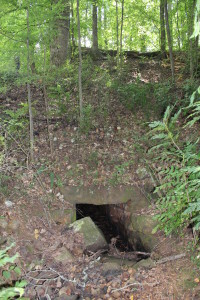 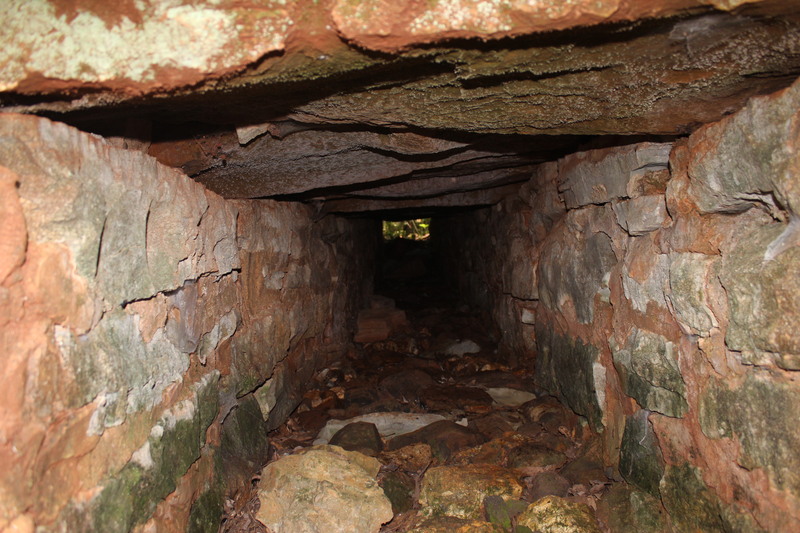 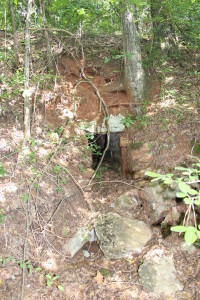 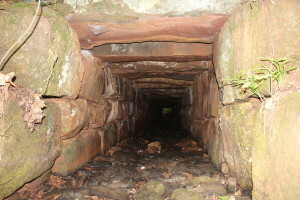 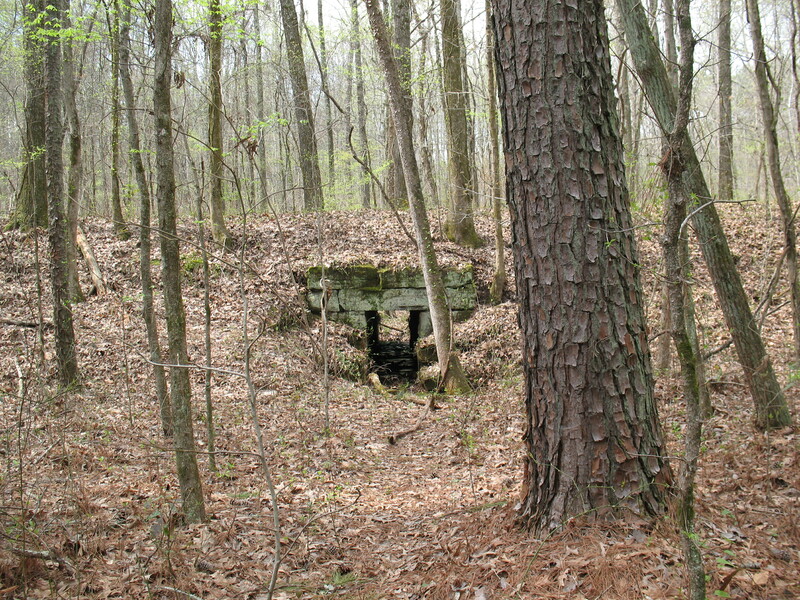 Note that one of the photographs below is of a lintel stone still in the quarry near Altoona, Alabama, where the stones for the culverts in that area were quarried. 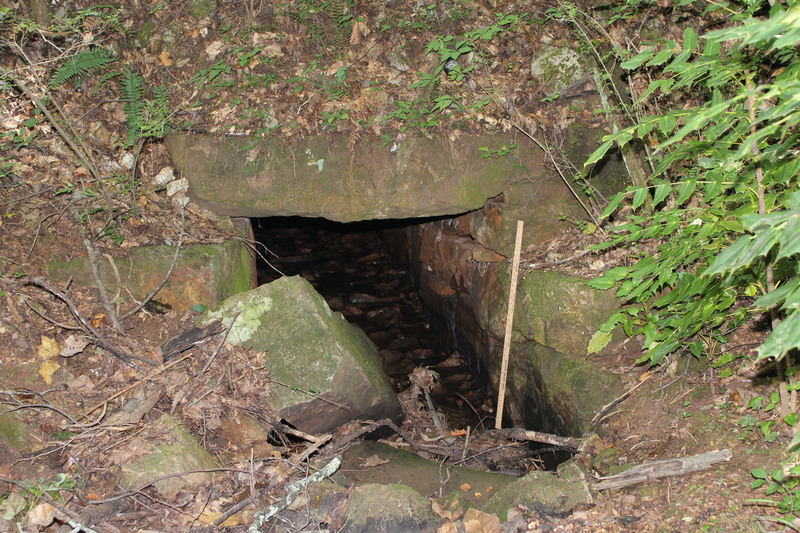 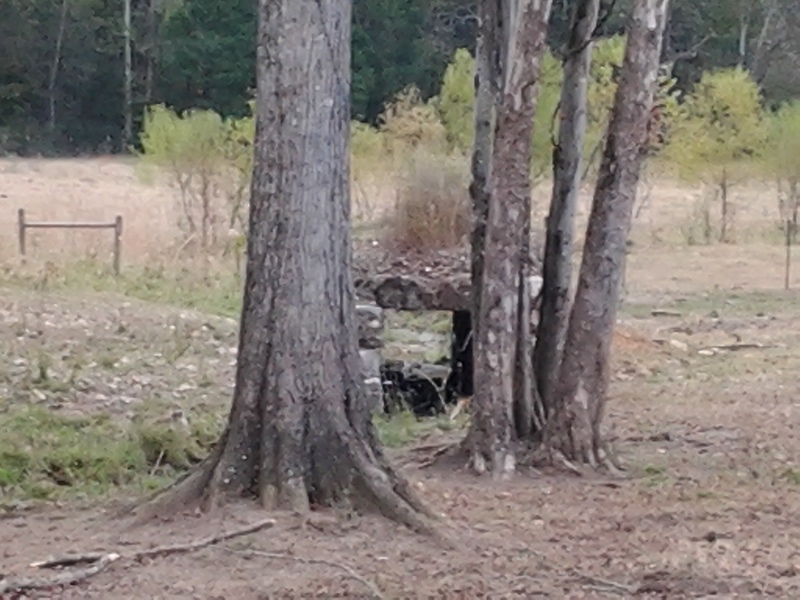 Note that one of the photographs below on the Living River retreat property shows a lintel stone that has lost its footing on both sides and has fallen forward across the opening of the culvert but not completely blocking the entrance to the culvert. Several “round culverts” have been found as part of the BMRR roadbed. These are made of iron (or steel) or clay (terracotta) pipes ranging up to 36 inches in diameter. Historic L&N documentation indicates that the amount of area to be drained by each culvert was to be calculated and that round pipe was to be used up to a diameter of 36 inches if the amount of drainage area would allow that. 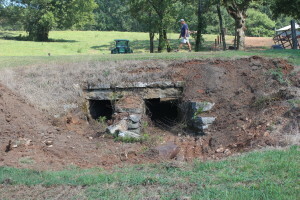 If the drainage area was too large for a 36-inch pipe to handle, a cut-stone box culvert was to be used. 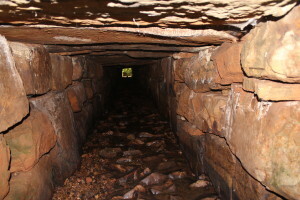 If has been observed in the BMRR roadbed that round pipes also allowed the passageway to be angled (usually upward at the upstream end) whereas cut-stone box culverts had to lay flat their entire length. 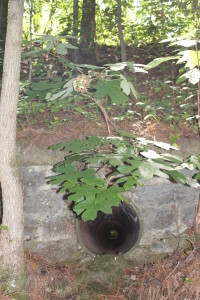 The end of the pipe (most often at the downstream end but sometimes also at the upstream end) is “encased” or built into a wall of stones laid around the pipe to support it and to keep the surrounding dirt from washing away which would compromise support of the end of the pipe. 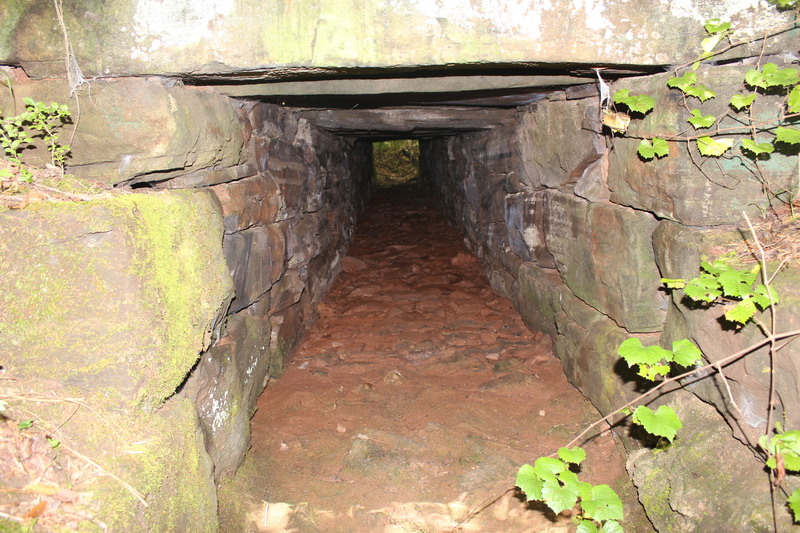 These walls are the only ones seen thus far that included mortar between the stones, perhaps because the stones used were much smaller and less thick than in the box culvert construction. Examples of these round (pipe) culverts can be seen in the photographs below. 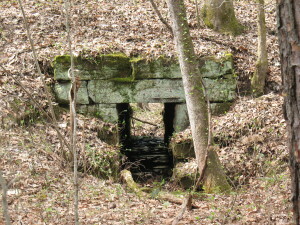 Concrete came into use for this purpose around 1900. 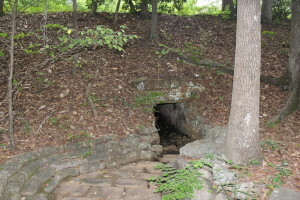 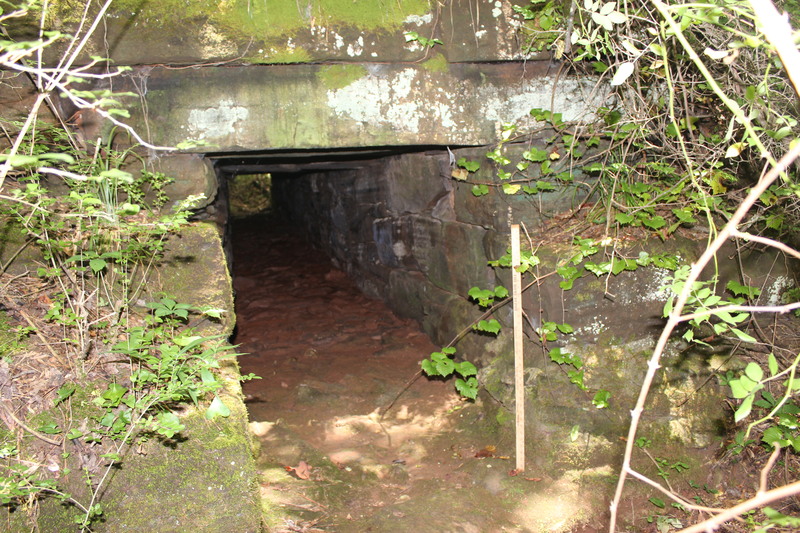 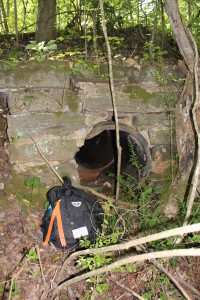 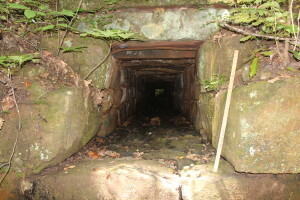 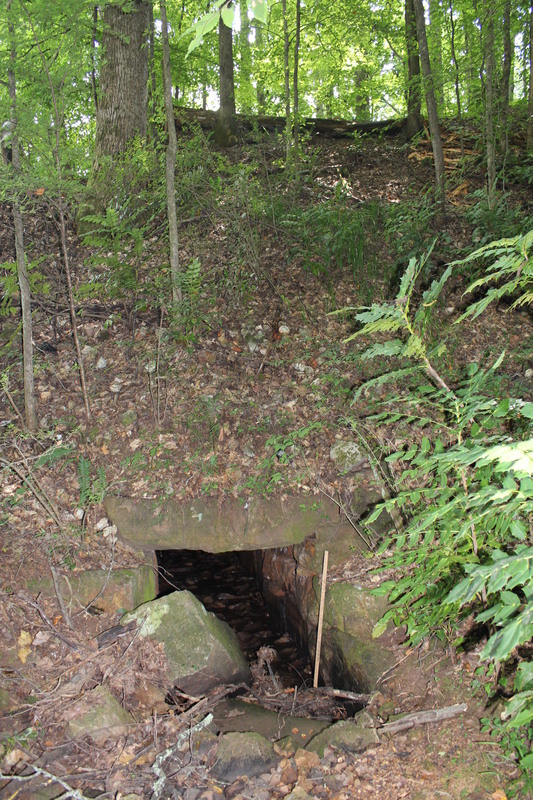 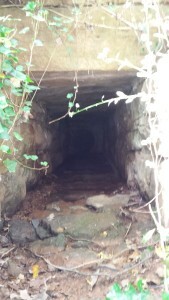 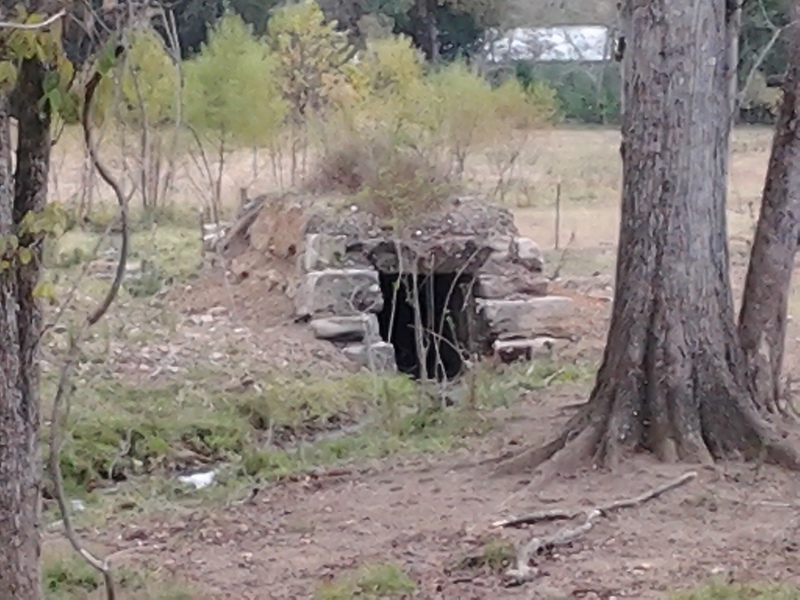 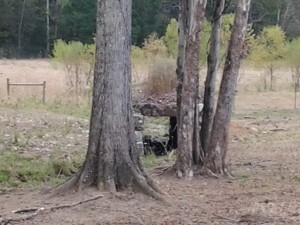 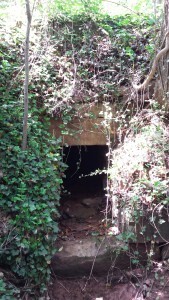 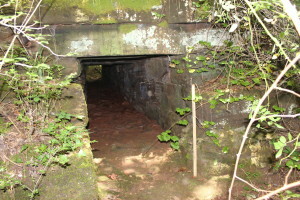 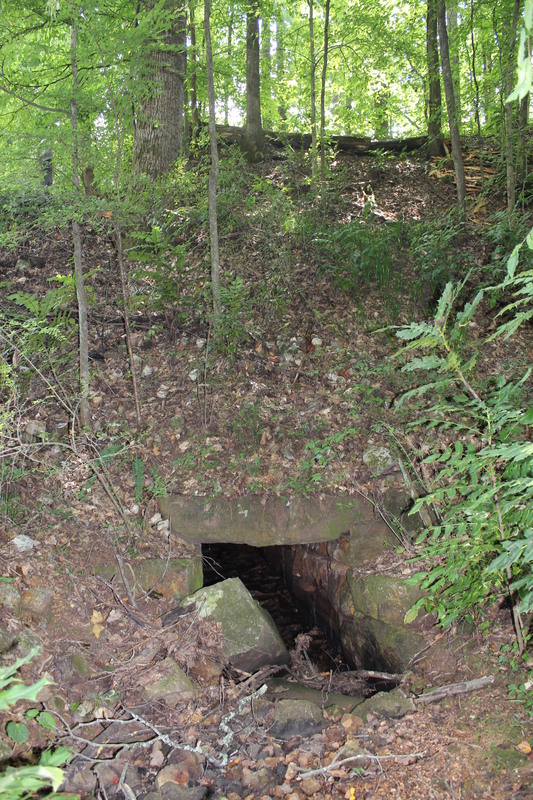 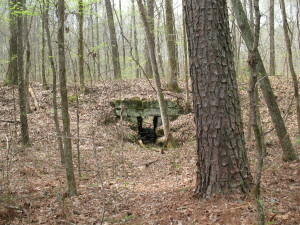 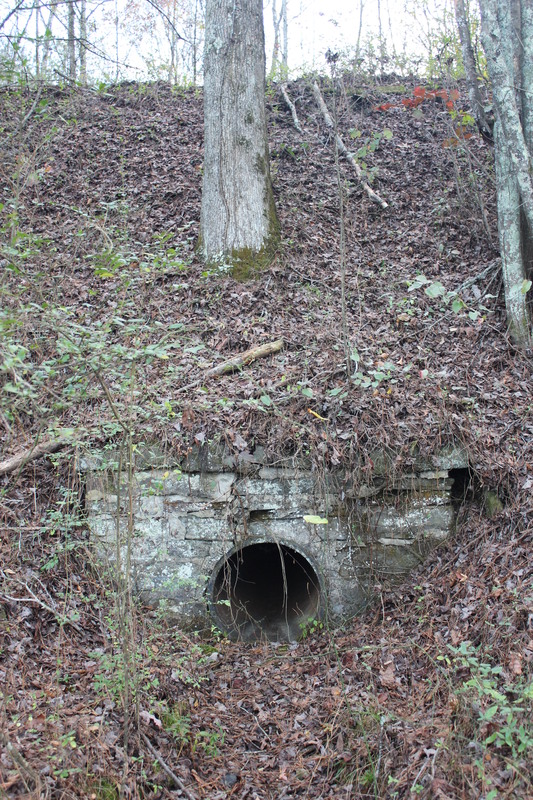 An example of such a concrete culvert can be seen in the former BMRR roadbed in Altoona, Alabama, within sight of one of the older, cut-stone culverts. 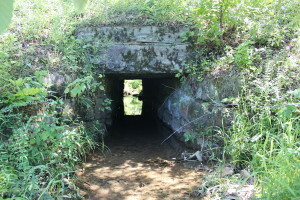 The concrete culvert in Altoona is the same size and basic box construction as the cut-stone culverts. 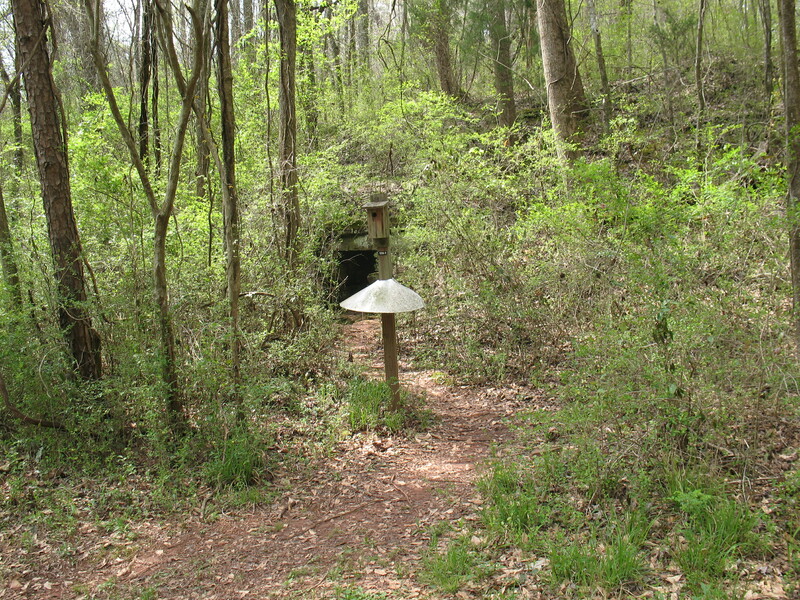 South Branch — Click HERE. 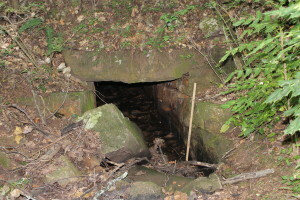 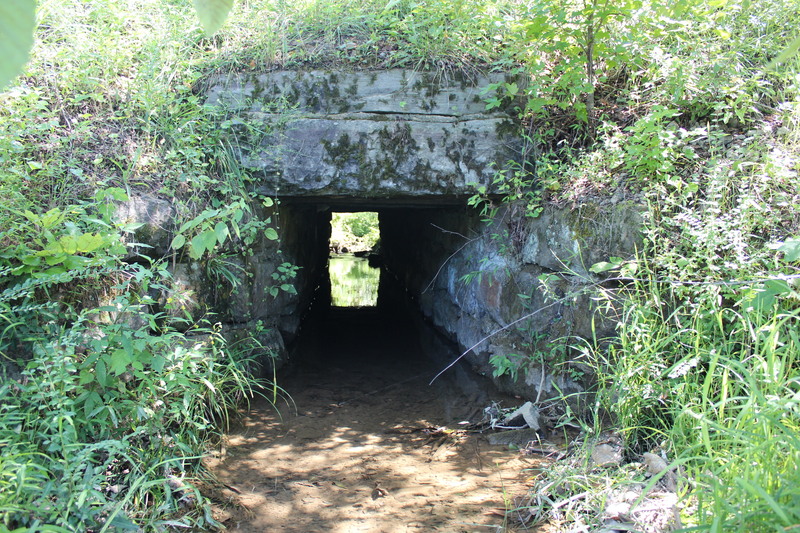 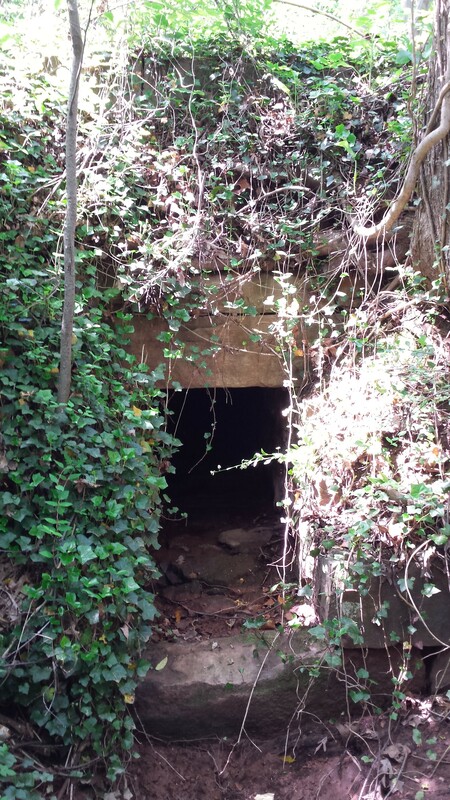 PRESENTED BELOW are photographs and location information as documentation of many of the historic stone culverts that can be seen as part of the old BMRR roadbed. 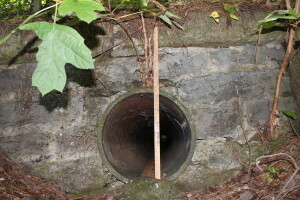 Culvert with yard stick for scale. 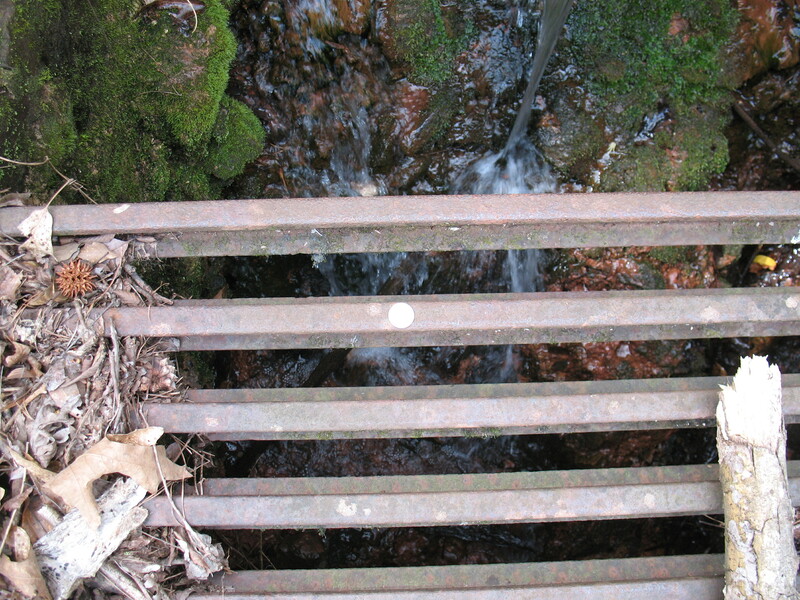 NOTE Grate made from small-gauge tram rails. 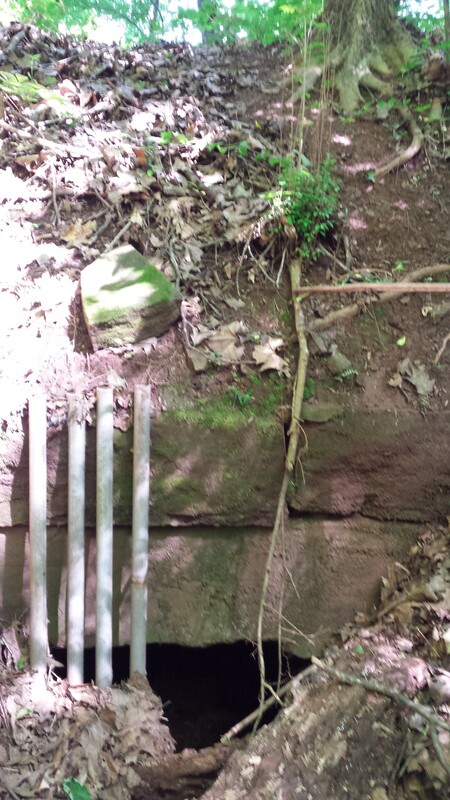 NOTE quarter on tram rail for scale. 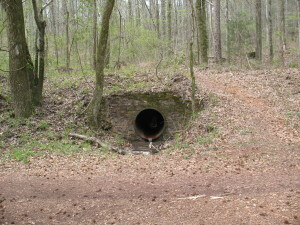 Upstream end of culvert near deadend of Lance Way. 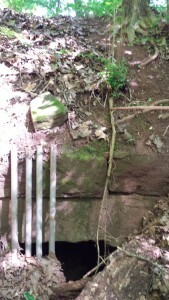 Upstream end — note dislodged cut stone. 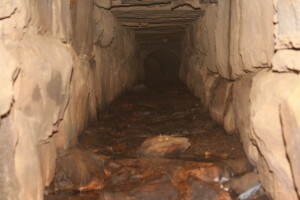 Upstream end — Inside of culvert. 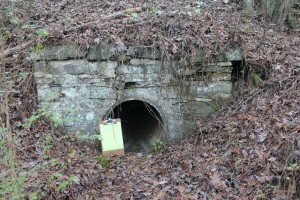 Note other end of culvert. 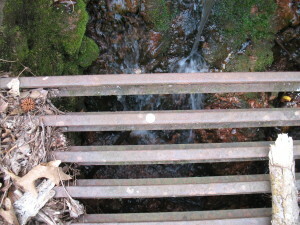 Downstream end of culvert. 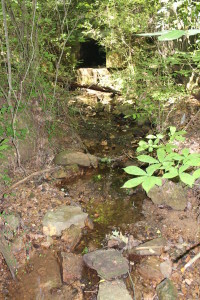 NOTE stream flowing through culvert. 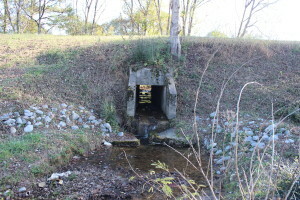 Private property next to former South Roebuck Ballpark and Swimming Pool — CAUTION: This culvert is on private property, and that property must not be entered without permission of the owner. 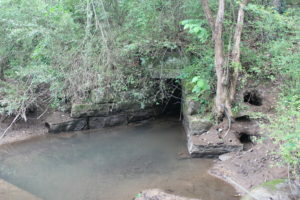 Culvert nearest former ballpark and pool. 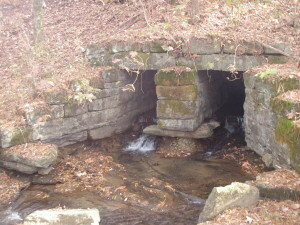 Culvert between former ballpark/pool and Lance Way. 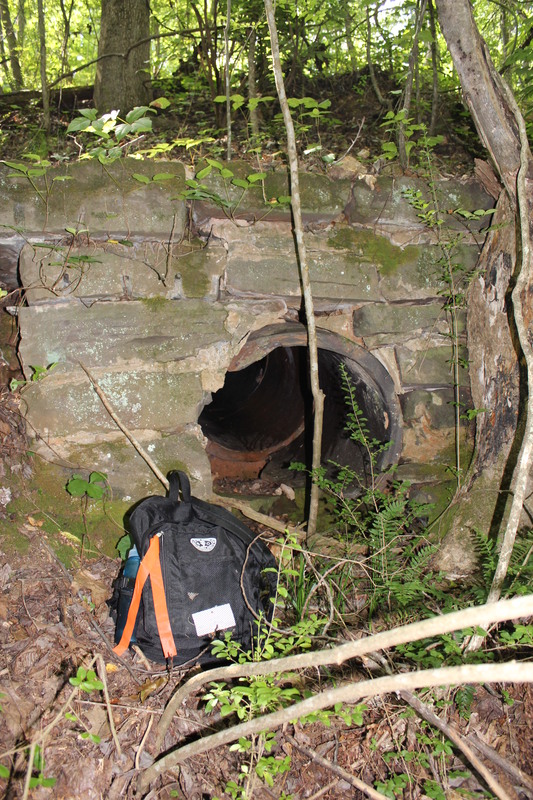 Culvert with backpack for scale. 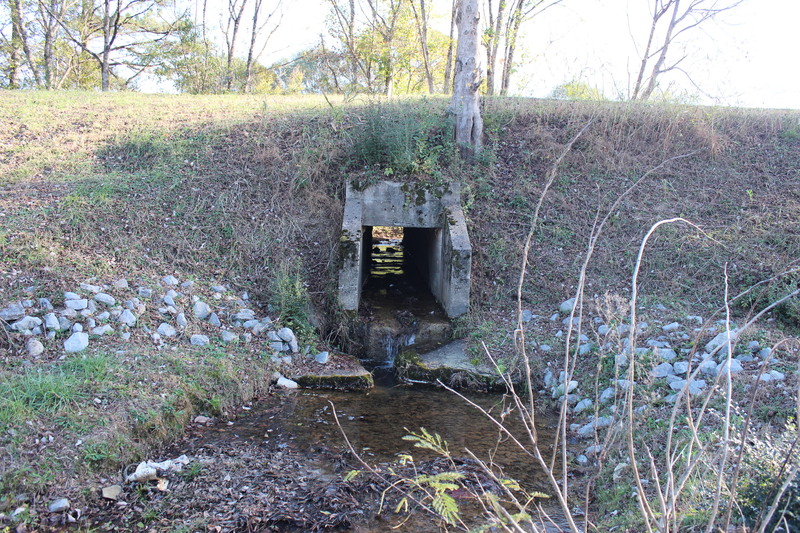 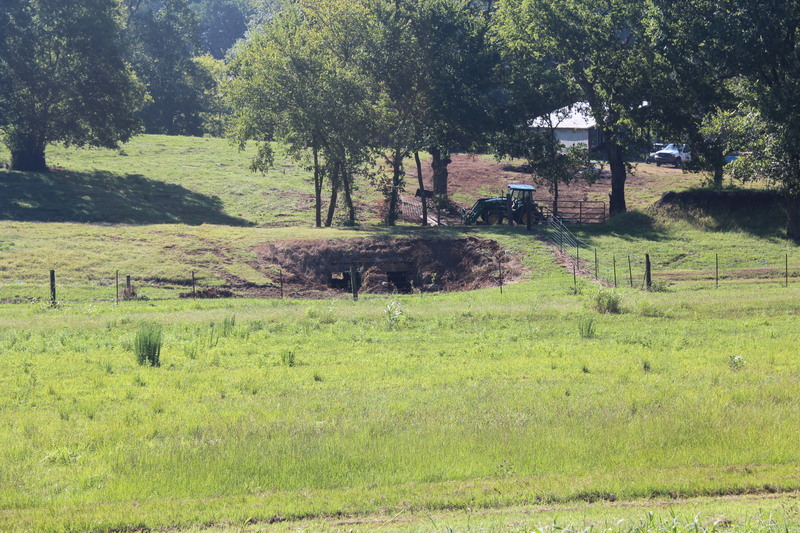 DOUBLE Culvert in Farm on Highway 75 north of downtown Pinson. 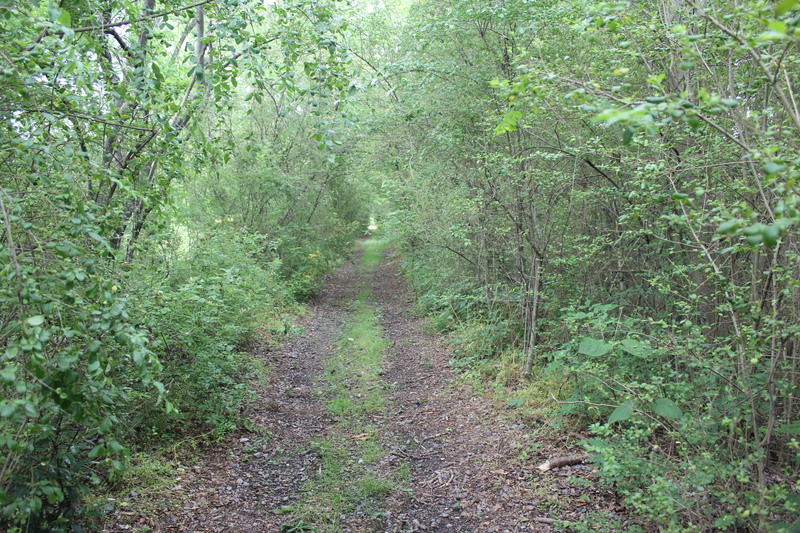 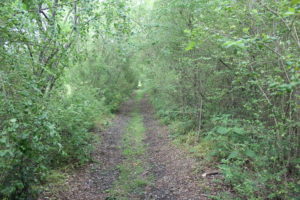 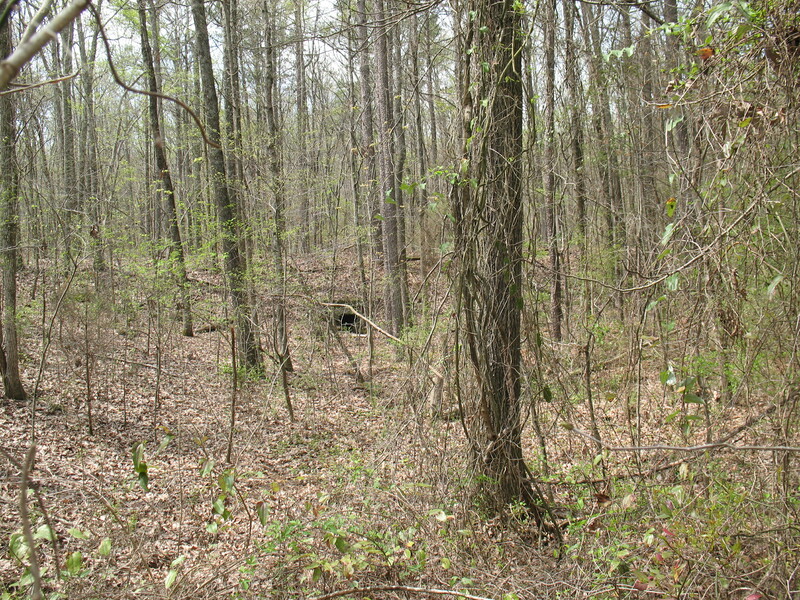 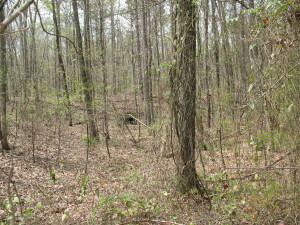 Former BMRR roadbed above culvert — view looking toward Miles Spring Road. 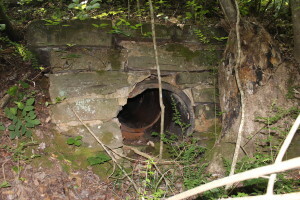 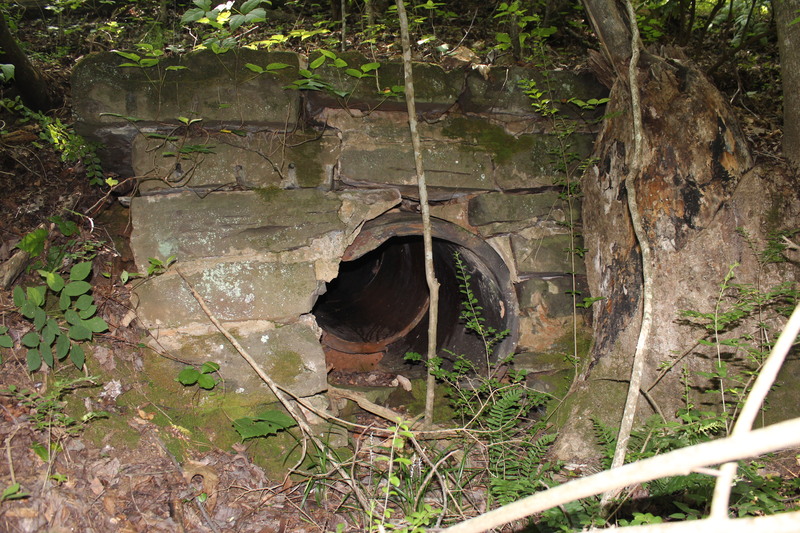 Pipe culvert as part of roadbed of the Huntsville Branch No. 2. 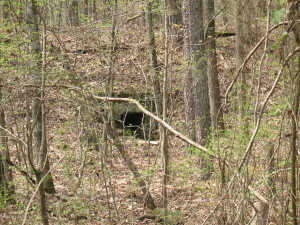 CAUTION: This is on private property which must not be entered without permission of the owner. 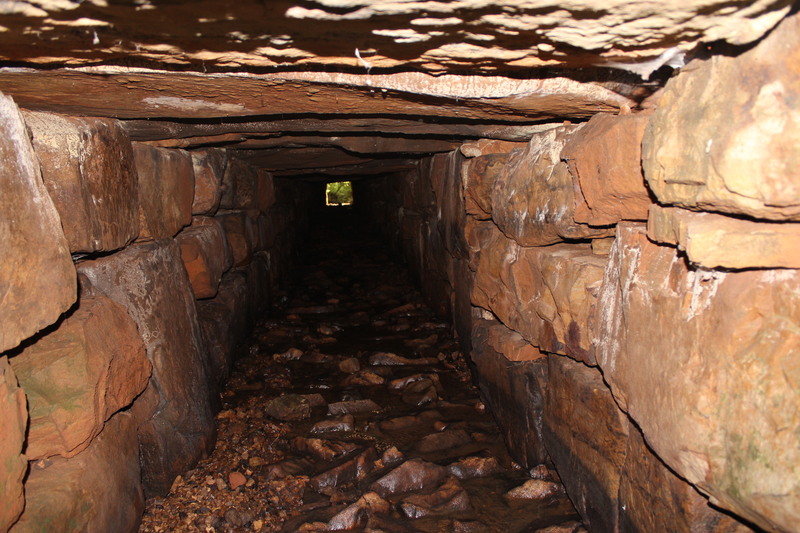 Champion Mine pipe culvert. 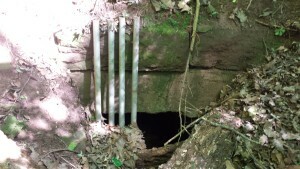 August 4, 2016. 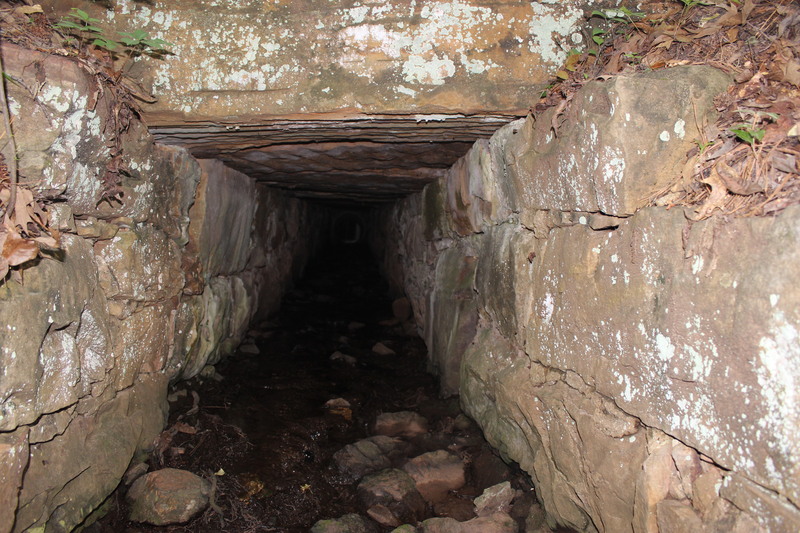 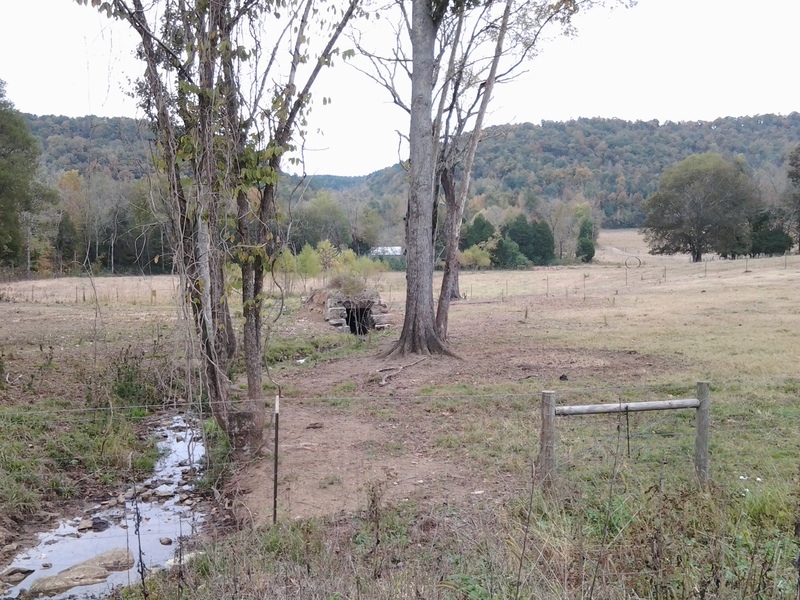 “Double” culvert near Altoona, Alabama. 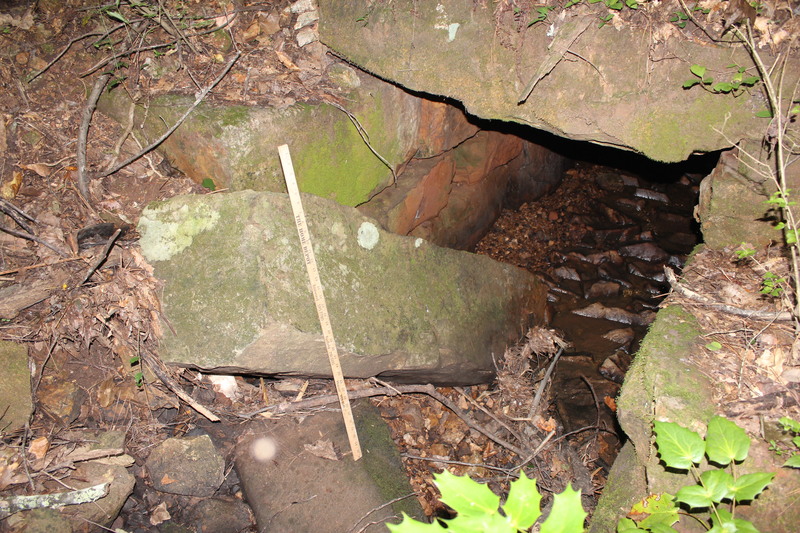 NOTE: The images shown here are the downstream end of the culvert. 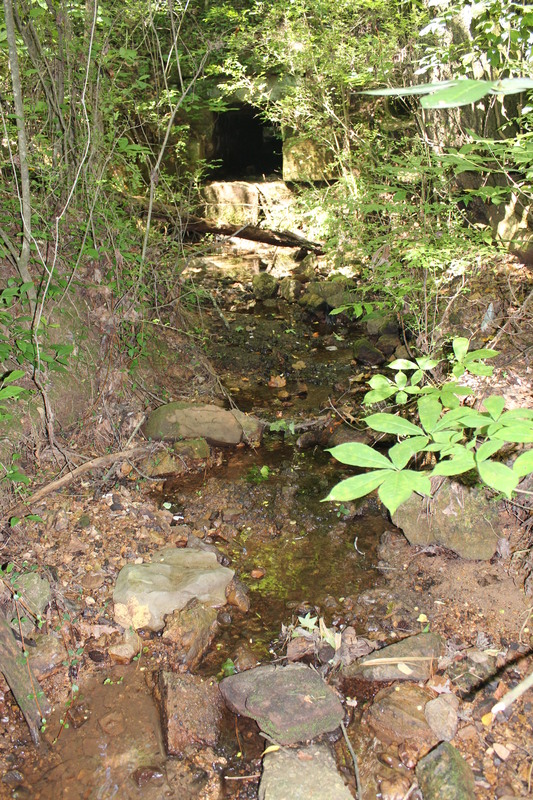 On the upstream end of this culvert, a more recent flow control structure has been installed. In one of the images, part of the newer circular flow control structure can be seen as viewed looking through the culvert. 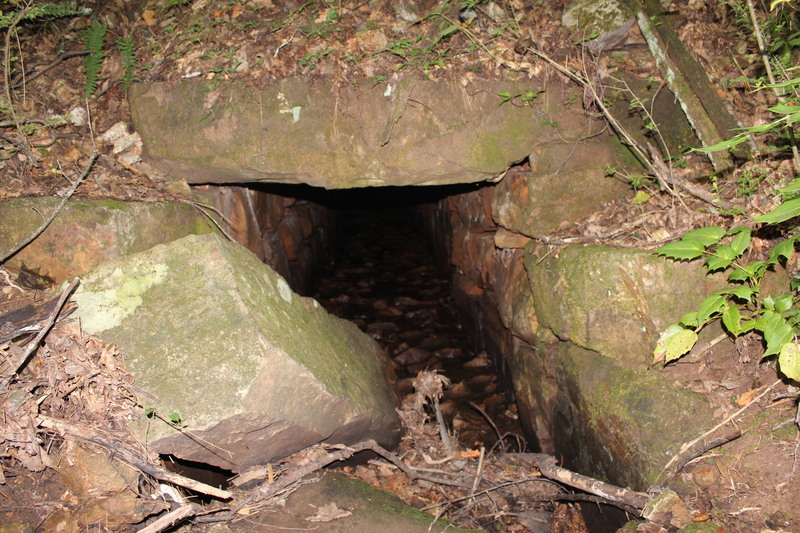 NOTE: The huge rock in front of the culvert opening is one of the lintel stones that has fallen off its support stones at the entrance to the culvert. 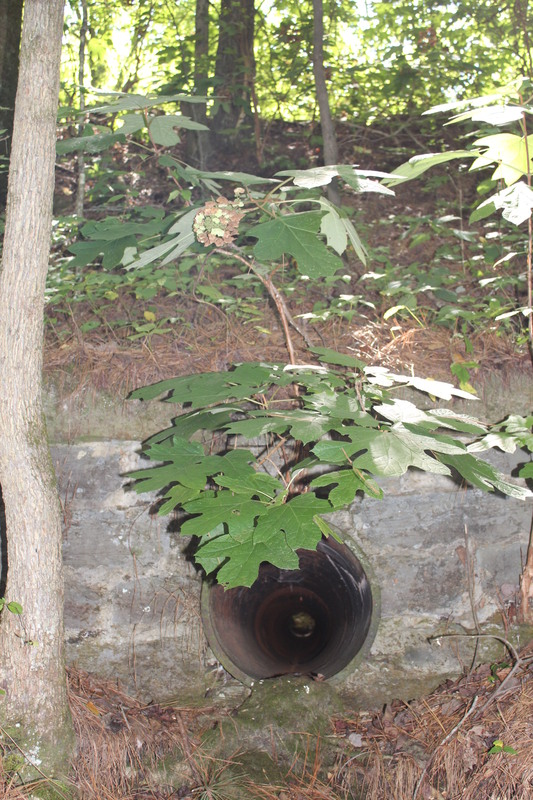 This has not impeded the flow of water through the culvert. Living River — Downstream end of culvert. 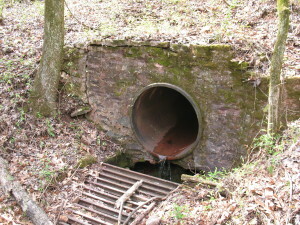 Part of newer circular flow control structure can be seen at upstream end inside of culvert.